Ferguson Advertising is an advertising agency located in Fort Wayne, IN. If you're unable to see a urinal photo above this line, it is being stripped out by your browser's ad blocker extension due to its location at an advertising agency. To view it, disable your ad blocker for this page. This photo was sent in by ZM. He writes: "I am extremely surprised that your site has over 3,600 urinals and no one has submitted one from Fort Wayne, Indiana’s second-largest city. That said, there’s a first time for everything. 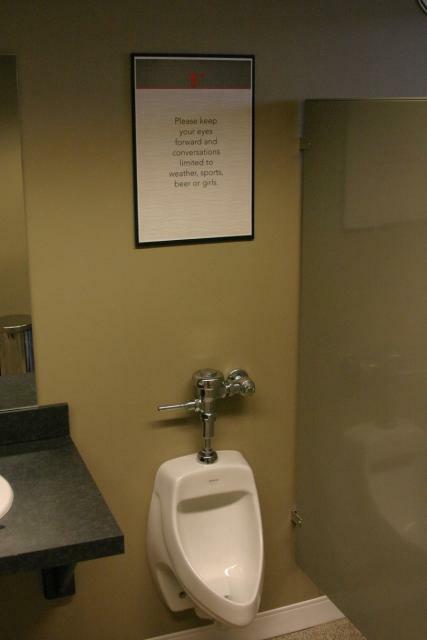 And I’ll start with the urinal at Ferguson Advertising here. First, a little history of the company: Ferguson Advertising was founded in 1975 by Richard Ferguson in Fort Wayne, Indiana. Nancy Wright, now co-owner, joined a year later, and Rich’s son John is now co-owner of the agency, one of the largest in the city. For 36 years, the company was based in the sixth floor of the Courtside Building in downtown Fort Wayne, and was one of the longest-running tenants in Courtside. But as we grew, we also outgrew Courtside and began planning a move to the third floor of what is now the FA Building (named after our corporate initials). This little Kohler (all the urinals and toilets in our new offices are Kohlers) was part of the extensive office renovations on the third floor of the FA Building. On some floors of the building, you have to step up to get to the toilets (thankfully, not the case in our renovated bathrooms). The poster you see above the urinal was an in-house job done by our creative team. Now, a little history behind the FA Building: The building was built in 1925 as a medical building in downtown Fort Wayne, and was called the Medical & Professional Building for many years. This was in part due to many medical offices and the fact that it is close to St. Joseph Hospital. The last medical tenants moved out some time ago, and Ferguson Advertising moved here in January 2012, with the name change occurring in October that year. Today, in addition to Ferguson Advertising, the FA Building is also home to the YMCA of Greater Fort Wayne offices, two radio stations, a personnel firm, a community legal clinic, and a strategic advisor firm. Enjoy, and I look forward to bringing you more pictures from Fort Wayne in the months and years to come."